Deans favourite restaurant causes a great hit with the gang!! 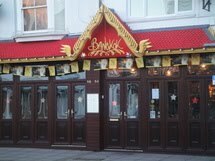 If you wish to sample good and interesting Thai food, than head to Southsea for a visit to the Bankok cafe. As with the other restaurants in the vicinity, the setting is small and can be crampt when busy, but the owners have made the best of the restaurants space as they can, with very nice decor, which isn't over the top for the Thai theme. The menu is varied and offers something for spice lovers as well as those preferring something a little less on the hot side! Clair and Dean, who have been here before, opted for the wonderful crab meat and sausage cakes which are really lovely, whilst Gemma tried a twist on the prawn toast idea with pork toast. Again, really tasty and worth the money! The mains were just as delicious. Recommended by myself, is the garlic chicken wings..........fab!! As with most desserts in far eastern restaurants, the menu was limited for afters. You have to ask for the dessert menu, as it is not offered to you. obviously, not many customers eating here ask for the dessert menu!! dean and Clair had the white chocolate bombe, which tasted like it had actually melted and been frozen again. Not quite to par with the other courses. Mikes banana split, however went down very well and had been made fresh with as better tasting ice cream. No cherry as in the picture in the menu though hahaha.